Southlake, TX – NVision, Inc., recently used its CT inspection and reverse engineering services to help a leading beverage manufacturer resolve sealing flaws in its large-sized bottles. 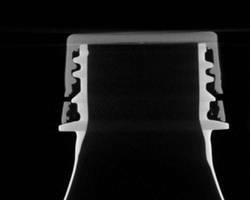 NVision, a leader in U.S. reengineering services and technology, used its advanced computed tomography (CT) scanning technology to inspect the sealing surfaces of the bottles and reverse-engineer them so that the sealing problems could be isolated and resolved. The beverage-maker, a popular producer of soft drinks and other beverages, was producing bottles with perfect seals. However, when certain bottle sizes were scaled up, sealing flaws began to appear. Company engineers examined the bottles and manufacturing process but were unable to find the source of the problems. The manufacturer brought in NVision, nationally known for its highly accurate scanning and reverse engineering services. NVision was tasked with reverse-engineering a bottle and lid so that the manufacturer could then perform computer simulations to determine the source of the problems. NVision decided that CT inspection offered the most accurate solution for solving the sealing problem. CT scanning is a non-destructive process that utilizes x-ray equipment and a detector array to produce 3D computerized representations of both an object’s internal and external components. With CT scanning, design and manufacturing requirements for components are confirmed quickly and with the highest degree of accuracy - from 0 .0002 inches / 0.005 mm. The dataset from the scan is a STL (stereo lithography) format file, which is opened in specialized software and can be used for rapid part-to-part inspection, part-to-CAD inspection, or reverse engineering to a native CAD file. “CT scanning is typically utilized when a customer’s needs exceed the capabilities of laser scanning. It’s particularly useful for accurately inspecting the internal geometry of transparent materials - such as glass bottles – and discovering hidden flaws that might not be detected by other forms of scanning,” said Steve Kersen, VP of Sales and Marketing at NVision. NVision technicians first CT-scanned a regular-size bottle and lid separately, then scanned the assembled bottle and lid, and performed an inspection of sealing surfaces. The scanning and inspection took less than a day and the sealing surfaces on the assembled bottle and lid were confirmed to be working. “Another reason why CT scanning is ideal for sealing inspection is that bottle leakage involves a natural contrast agent – air – that might not be seen in other scanning but which stands out in a CT computerized image. In this case, if the surfaces had not been sealing properly we would have seen the air as a distinctly black color on the CT image, indicating where seepage was occurring,” said Kersen. After NVision confirmed that the bottle and lid surfaces were sealing correctly, the manufacturer was able to utilize the CAD information from the CT scanning to find, isolate, and resolve the sealing issues of the larger bottles through re-design. In another recent application of its CT inspection technology, NVision was asked to help a major manufacturer with a project involving composite insulation. The pore size of the composite material was critical. There was a maximum size the pores could be to meet quality standards. Anything less and the insulation would not be acceptable, bringing the project to a halt. NVision technicians were able to detect density changes greater than .25 g/cc from the base material. With scan oversampling, voids as small as 1/10 the scan resolution could be found and quantified. NVision was able to meet the tight inspection deadline, scanning and returning the material within 48 hours. The results showed that all pores in the composite insulation were significantly smaller than the allowed tolerance and the project was green-lighted to proceed. “Continued improvements in processing speed, coupled with the capability to find and identify small details that would be undetectable to other forms of scanning, are moving CT scanning to the forefront of essential technologies for industrial inspection,” said Kersen. For more information, contact NVision, Inc., 577 Commerce Street, Suite 100, Southlake TX, 76092. Tel: 817.416.8006, Fax: 817.416.8008, Email: sales@nvision3d.com, Web: http://www.nvision3d.com/. For companies seeking the best 3D scanning services and equipment, NVision, Inc. (http://www.nvision3d.com/) delivers on-time, on-budget solutions that drive innovation and transform performance. For more than 25 years, NVision has worked on some of the most difficult 3D engineering challenges in aerospace, oil gas, medical and other industries. Our versatile team of experienced engineers is ready to provide comprehensive assistance with first article inspection, reverse engineering, system purchases and more. NVision's clients include leaders such as Alstom, Boeing, GE, Lockheed, Lear, NASA, Porsche, Raytheon, Siemens, Toyota, and every branch of the U.S. military.